January 1 of every year, a Japanese tradition is celebrated here in Hawaii. 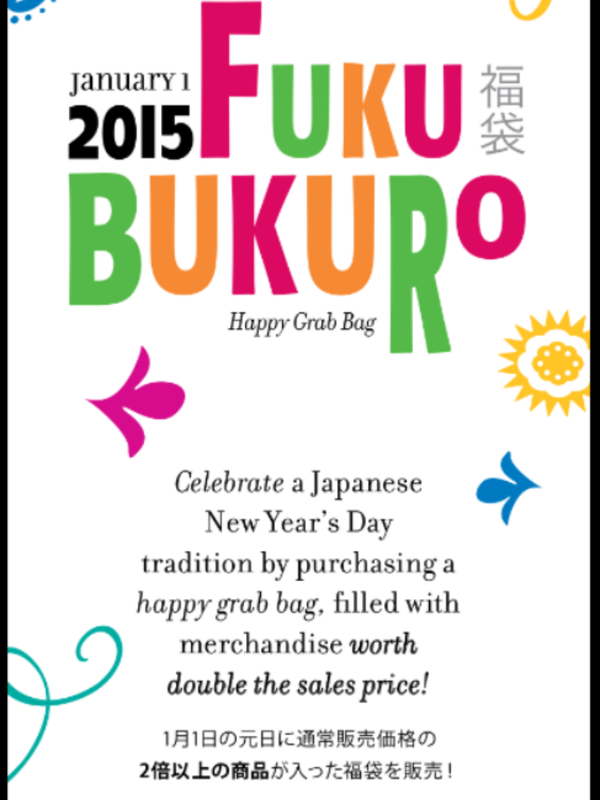 Fukubukuro, meaning “lucky bag,” is a Japanese new year custom where merchants fill bags with popular items and sell them for substantial discount, usually 50% off or more. The shoppers aren’t able to see inside the bag, until after the bag is purchased. This tradition began in Tokyo in the early 20th century. Japanese superstition has says the good fortune in one’s Fukubukuro bag, reflects the luck they will have in the New Year. Get ready for another NHK annual New Year’s Eve music program “The 65th Kohaku Uta Gassen”. This years lineup will be hosted by Actress Yoshitaka Yuriko and popular group Arashi. This year’s “65th Kohaku Uta Gassen” program will feature a total of 51 artists. First-time appearances by HKT48, May J. (performing the popular song “Let It Go” from Disney’s Frozen. ), Yakushimaru Hiroko, V6, SEKAI NO OWARI. In addition, TV anime ‘Youkai Watch’ and anime character ‘Jibanyan’, along with King Cream Soda and Dream5 will be performing on the show, but will not competing. Ayumi Hamasaki, will not be performing for the first time in 15 years. She told fans on Twitter that she preferred to focus on projects she wants to do, rather that on what she feels obligated to do. Who will win the 2014 competition? You have to watch to find out! So far, the red team (female) has won 29 times, and the white team (male) 35 times. Thursday 1/1/15 on KIKU Station.